Saturday, August 2, 1997, started with the loading of furniture on trucks for the four guests that had lived with me a few years in Dodge City. Three Sarajevo students - Emir, Amer and Denis - and my St. Louis student guest, Daniel Diaz, were all en route to apartments in Lawrence, KS, each going that fall to the University of Kansas. My teenage son Jon, visiting for the summer, was going with us. 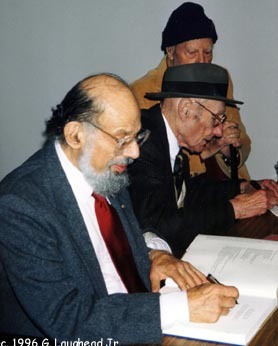 James Grauerholz had invited Jon and me to dinner with William Burroughs that night. Jon had never met William, but was a friend of James. We looked forward to the evening. Arriving at Grauerholz's Lawrence house on 19th Street, it was strangely dark and silent. We drove by Burroughs' small red cottage on Learnard Street. It, too, was dark and empty -- cold. Returning to the Bosnians' apartment, I tried a few times to reach James. No word, no answer. Late that evening, while drinking coffee at my friend Charlie Whitman's bar The Bourgeois Pig, I tried James once more. He answered. "William's dead. He died at 6:30 p.m. I have to go back to the hospital and arrange for the body. Come by later," was about all that James could get out. I bought a round of vodkas and walked back to the table where my friends and son were sitting. "Here's to William S. Burroughs. May he rest in peace." Jon and I got in my van and drove to Lawrence Memorial Hospital. Standing in the circle drive, we could see James, sitting in a second floor window, his body jerking forward at one point. Jon and I just stood for a while, both knowing that history was being made. Leaving the hospital a short time later, we drove back to James' house. He was just arriving with Bill Rich. Jon and I circled on the drive and got out, just as James was at his east house door. A hug and a kiss and a very sad James saying, "George, now I guess you're my oldest friend - the circle is complete." Jon didn't get to meet William Burroughs, but instead listened to James planning the funeral, while we ate the deli food I picked up. Later that night, lists were started. Calls had begun to James -- over a 1,000 by August 6, the day of William's funeral. A few of us used Burroughs Communication office telephones to make calls to lists. These calls were to people that might want funeral service information early enough to come to Lawrence. I got to call a few famous names myself -- in the age of caller ID, they were all answered. I noticed that Gregory Corso was on one list we had; unfortunately, he was not able to attend. I was fortunate to have spent the evening of July 4th, 1997, with William, James and TP. Before leaving on a long first visit to Bosnia, I had left my van parked in James' yard. "Hope you don't mind that William and I used it?" James had asked. Actually, I thought it cool that William had wanted to ride in it. After arriving back from Bosnia on July 4 at the Kansas City MCI airport, I had been given a ride to James to pick the van up. A note on James' door, told me that he was at Williams' and to come over. The Martian Rover was on television, William passed a pipe and drank his vodka cokes. The fireworks in his backyard -- it was still legal in Lawrence -- were bright and loud. One parachute-type got caught in a tree and TP climbed up to get it off a limb. William keep yelling "You can't do it. It's not possible!" at TP -- I thought it must have sounded like what he said to a young Allen Ginsberg or Jack Kerouac -- said to make sure they did what they were thinking about doing anyway. James walked over to William as TP was climbing the tree, and asked "can I hug you William?" We smoked from the last box of Williams' joints. Every day a dozen or so were rolled for him - a mix of A+ and A- weed - to keep William from getting overly stoned. 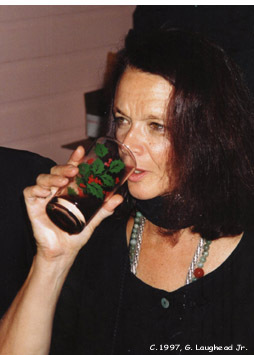 Sitting next to poet Anne Waldman at dinner, I enjoyed stories of William and James in New York City during the 1970s. Anne remember the young Grauerholz at the St. Marks' poetry events -- she was founder of the St. Mark's Church Poetry Project, before starting Naropa University's Jack Kerouac School of Disembodied Poetics, with Allen Ginsberg. William Burroughs taught there. With John Giorno at James' side, and Anne at mine -- the table included Andrew Wiley, Burroughs' literary agent; Ira Silverberg; Jose Ferrer; TP; Jim McCrary, William's office manager; and McCrary's wife, Susan Ashline; Bill Rich; Grauerholz's cousins from KC, Mo., Daniel Diaz and a few others I didn't know. Return to the Beats In Kansas or to the Kansas Heritage Group.